There are many other opportunities to help StringsforaCURE® continue to educate, comfort, support and provide financial assistance directly to cancer patients, primarily those with breast cancer. (Photo) Elisa Guida receives a check in the amount of $2,782.27 from Mike Batchelor, President of Erie Community Foundation during the press event at the Erie Zoo on August 23, 2013 for Erie Gives. 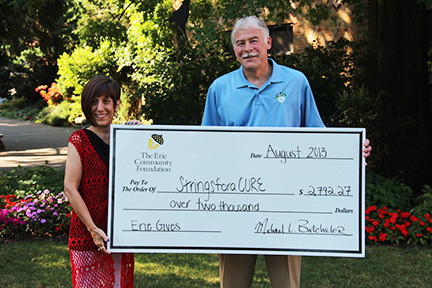 During the 2013 Erie Gives campaign StringsforaCURE received $2,782.27 in donations. During the 12 hour on-line giving campaign more than 4,000 donors gave over $1.7 Million to support the work of 301 different nonprofit organizations. Stay tuned for details on the 2014 Erie Gives campaign! StringsforaCURE helps so many cancer patients by providing education, comfort, support and financial assistance from the time of diagnosis through survivorship. However, when a patient loses his or her battle with the disease, we are overwhelmed at the thoughtfulness and generosity of the family when they recommend donations to StringsforaCURE in lieu of flowers at the funeral. Of course, one of the simplest and easiest ways to help StringsforaCURE is with a private donation. A private donation can be made to StringsforaCURE at any time and does not have to be associated with a particular fundraising event or project. Click here to make a donation to StringsforaCURE today.